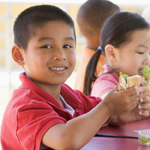 An Outreach or Marketing Plan is a well-thought-out strategy to promote and enhance the reputation of your school meal program. There are many avenues you can take to create a positive image for your program and you may wonder where to start. We suggest beginning with the above 6-Step Plan which will help you determine what you want to achieve and how to get there. Would you like to increase student participation? Concentrate on some of the resources on this site for students, such as the Students link beneath "Target Audiences" in the left-hand navigation column. Would you like parents to have a better understanding of the healthy foods you offer? We have resources for that audience as well, again under "Target Audiences" in the left-hand navigation column. for increasing salad bar participation to illustrate how to use the document. This completed plan may spark ideas for your marketing projects.